I know, I haven’t been very active on the blog here lately. One reason is because I’ve been finalizing proofing and promotion ideas for the new book, Bend Me, Shape Me, which will be out very, very soon. Very! Because of that, and because I don’t want anyone to get sick of listening to me, I have invited my fellow authors over at New Libri Press to guest post for me if they’d like. Acacia Awai is, appropriately, the first author to do so. It’s appropriate because she and I had our “babies” born just days apart, in the next room from each other, you might say. Acacia’s Scales was the first ever book published by New Libri Press and Painted Black was the second, released just a short time later. I hope you enjoy learning more about her. I know I certainly hope to meet her in person some day. Any excuse will do to get me to visit her beautiful Hawaii. I love Hawaii. I was born here, raised here and am now rearing my own family here. It sounds so cliché but it’s none-the-less true. I am an island girl through and through. 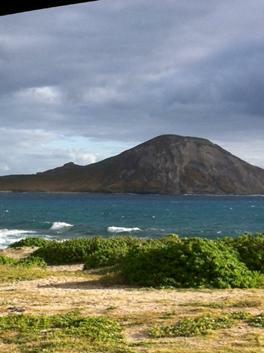 I took this picture of Rabbit island in Waimanalo after pulling on the side of the road on my way home. This view is part of the reason my heart sings a happy beat…even on a busy Monday morning. The drive from Waimanalo where we live to Hawaii Kai where my daughter’s school is, boasts scenery like this for the entire fifteen to twenty minute drive making the daily drag a lot less, well draggy. The blue water is absolutely something I look forward to seeing everyday. It’s in my DNA, well not really, but you know what I mean. So when I decided to write my first novel, Scales, I knew I had to include touches of the beautiful ‘blue’ that I love so much. Some of the scenes that I’ve described in the Scales series so far have felt like it became a character of its own. Blue, my main character, was named after the salt-laden watery stuff. Odd? Perhaps. Obsessive? Quite possibly. But really can you blame me? In addition to being hard-wired biologically to the beautiful blue, Acacia Awai was born and raised in Kaneohe, Hawaii. She loves French fries, diet Pepsi and ABSOLUTELY without a doubt she LOVES happy endings. She is a graduate of the University of Hawaii at Manoa where she earned a BA in PR Journalism. Acacia chose the backdrop of Hawaii to be cast alongside her modern day dragons because she hoped the combination of the two would be…magical. Magic, power and dueling clans are what fairy tales or really bad dreams are made of. So when Vivian Blue, a rare mixed breed, wakes up in Dragonkind instead of the Napili, Maui beach scene she was raised in, her life as she’s known it spins completely out of control. Will Blue stay away from the only family she’s ever known or make the ultimate sacrifice and leave her Hope Mate behind? Follow Blue and Hatch as their love is tested and their fates sealed. This entry was posted in Guest Posts and tagged Acacia Awai, Hawaii, Hope Mates, New Libri Press, Scales, Scales 2 by dborys. Bookmark the permalink.